Great thanks Winnie Lucas, this credirs taken from site ManchesterBeat, vaybe an error there of course. Great thanks Winnie Lucas, but this credits taken from site ManchesterBeat, maybe error there of course. 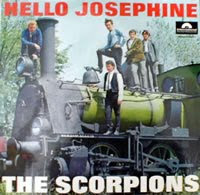 On this album of the Scorpions is not Mike the drummer but Ian Lucas. He is now living in Holland and the Scorpions still giving shows in Holland.